A new article by Kenneth Feeley from Florida International University, with STRI’s Stuart J. Davies, Rolando Perez and Stephen P. Hubbell and former staff scientist Robin B. Foster (now at the Field Museum, Chicago), was recently published as the cover article of the journal Ecology (April). The article, entitled “Directional changes in the species composition of a tropical forest”, examines changes in the composition of tree species growing on Barro Colorado Island, Panama, R,P. Feeley and colleagues show that over the past 25 years there has been a remarkably consistent and directional pattern of increasing abundances of drought-tolerant species at the expense of more drought-insensitive tree species. The cause(s) of this change remains uncertain, but the most likely culprits are either long-term changes in climate leading to reduced water availability (i.e., increasing temperatures and reduced rainfall), or alternatively the compositional changes may be the ongoing legacy of an extreme El Nino drought that occurred in the early 1980’s. By investigating compositional changes, scientists increase not only their understanding of the ecology of tropical forests and their responses to large-scale disturbances, but also their ability to predict how future global change will impact some of the critical services provided by ecosystems as important as those of the Panama Canal watershed. Join us kayaking on the Gatún Lake starting from Gamboa, near the Soberania National Park, where you will pass through the Tropical Rainforest at a smooth pace, following the stream and possibly coming across some unique jungle birds, monkeys, sloths, and other tropical species of flora and fauna. We will also visit a Embera community at the Gatun Lake and will have pic nic lunch there. Smithsonian Barro Colorado reforestation: great success! 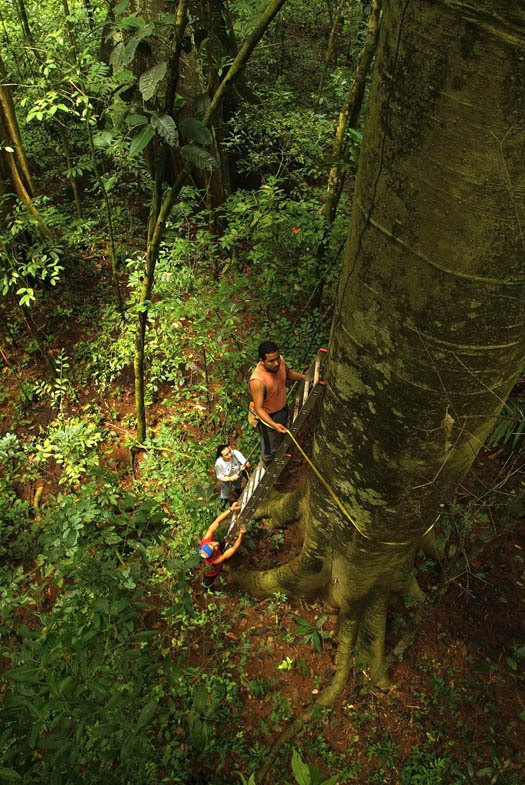 As part of the HSBC Climate Partnership, the Smithsonian and HSBC Panama have teamed together for a second reforestation in one year. On Saturday August 14, Kelly Walsh, from STRI´s Public Information Office and Climate Champions Adelvis Ortiz and Roberto Delgado, led a lively team of 30 HSBC volunteers to a plot in Parque Soberanía, near the Panama Canal Watershed experiment. HSBC and the Smithsonian devised a plan to divide the tasks of opening the holes, adding organic fertilizer and planting the seedling, into small groups. This organization was practical, as there was constant movement, allowing HSBC to plant 300 seedlings in three hours. At the Smithsonian in Panama, we study the past, present and future of tropical biodiversity The current climate change phenomena, a worldwide issue, is among our top priorities. Our association with the HSBC Climate Partnership gives us the opportunity to put this research into action, helping to re-establish the forest cover responsible for the environmental services needed for the operation of one of the world´s most important economic waterways.